Check out the post from yesterday for Part 1. 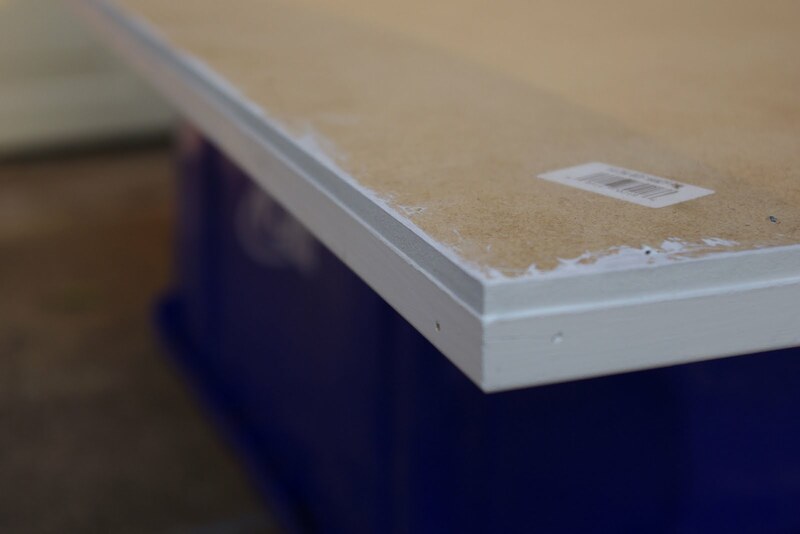 To continue on with the making of a chalkboard (and all the hard parts are done now) we will prep the trim and chalkboard itself. 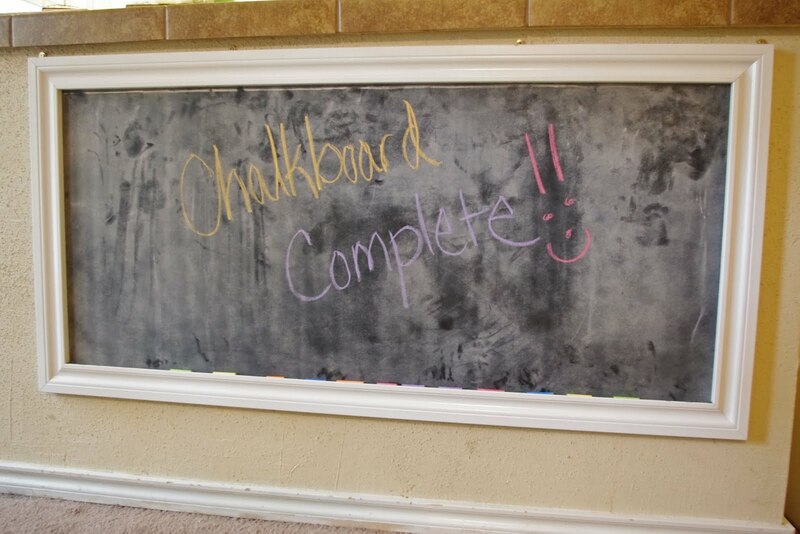 I spray painted the front of the trim, while that dried I "seasoned" the chalkboard. In order to "season" a chalkboard, take the side of a piece of chalk and rub it all over the chalkboard (after it has dried for at least 24 hours). Make sure the chalk you are using is made up of calcium sulfate and not clay. Clay chalk can easily scratch the surface. 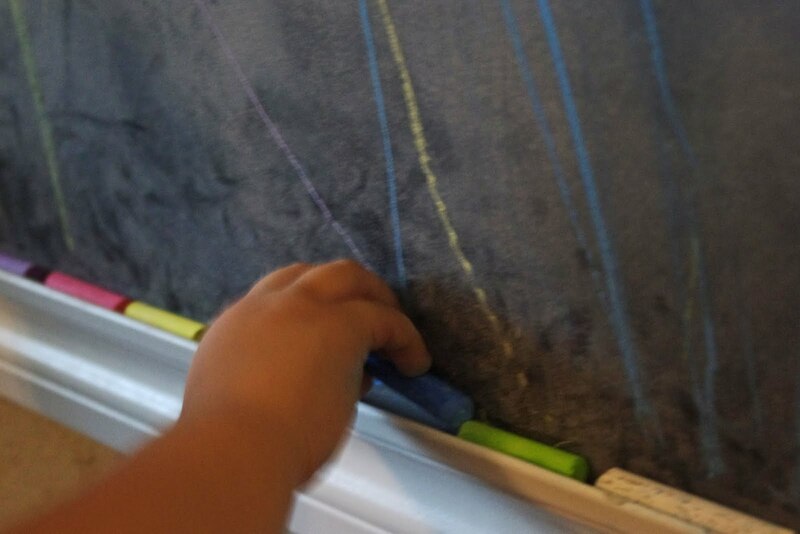 Once you "season" the chalkboard, take a felt eraser and erase the chalk and it is ready to be used. I still need to attach the chalkboard to the trim. In order to do that, I pulled out my brad nailer again. 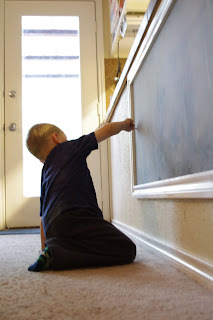 I laid the trim down first, then the chalkboard on top of it. 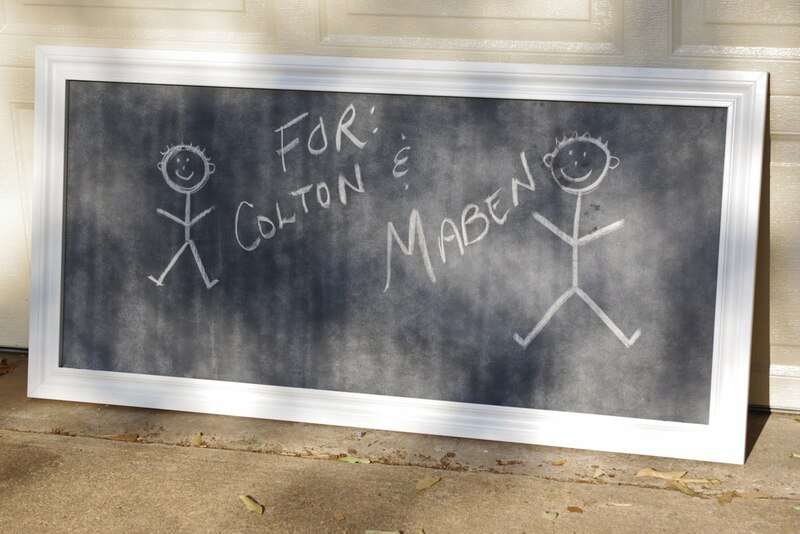 (Both right sides facing down) I then used alternating angles and shot the brads into the back of the chalkboard to attach it to the trim. 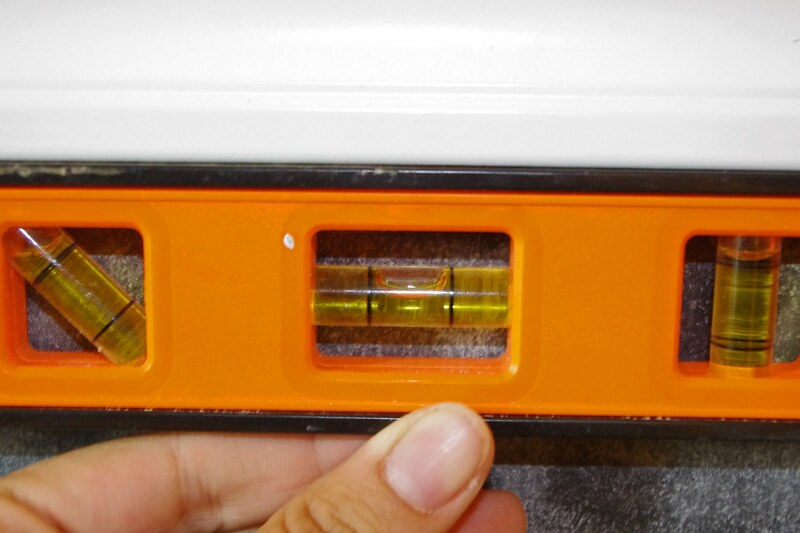 I had already sprayed the front of my trim, so now I take some primer and touched up the edges of the hardboard and trim. 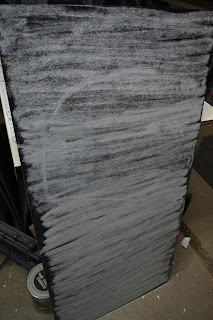 Once that dried, I spray painted the edges. Of course, by now the kids were onto what I was doing. So since everything had dried, I drew a picture for them. 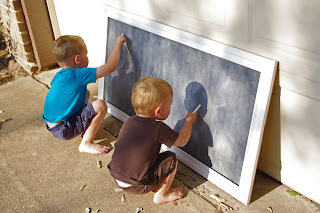 They loved what mommy had to draw so much, they erased it and tried to draw something themselves. All I had left to do now was figure out how to hang it up. I had the perfect spot picked out in the house for it. 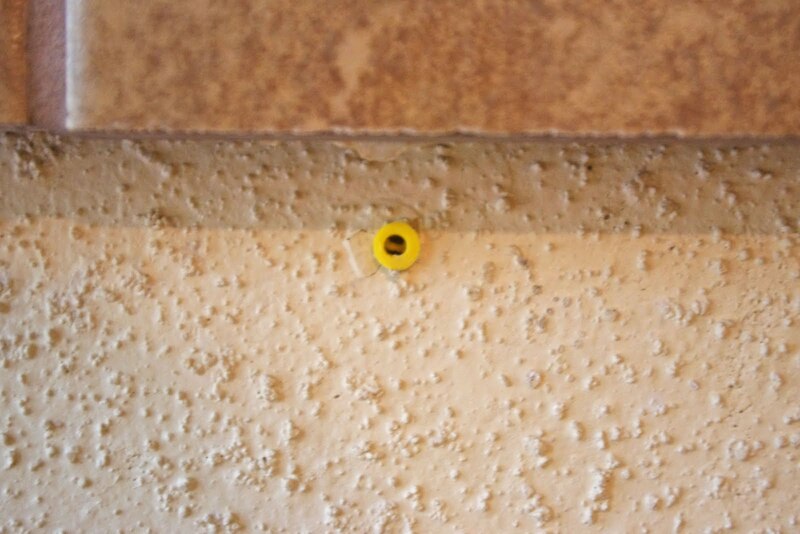 It would be on the half wall that is on the back side of my kitchen cabinets (the half wall is in the living room). I picked up some brass hangers. I decided a pack of 4 should suffice and marked the back of the chalkboard and predrilled my holes, then attached the hangers. 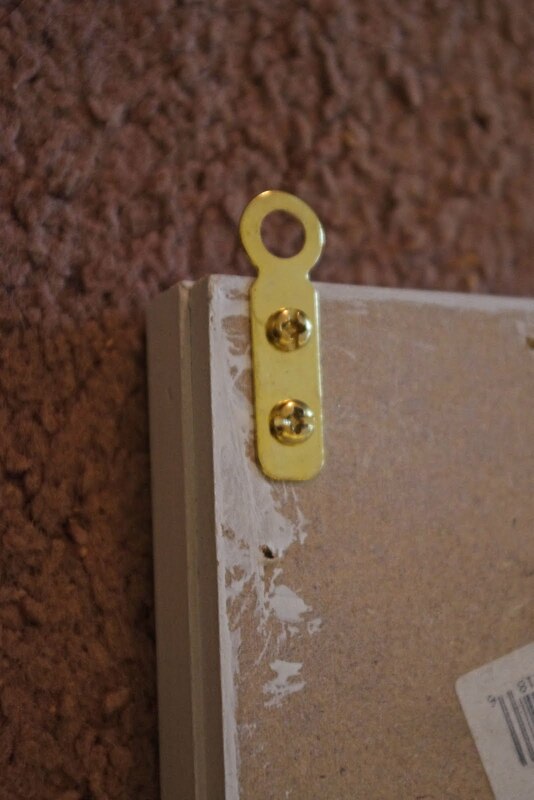 I held this up with my trusty level and marked out on the wall where it was going to hang. 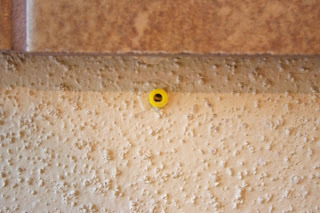 I drilled my holes and put in drywall anchors. 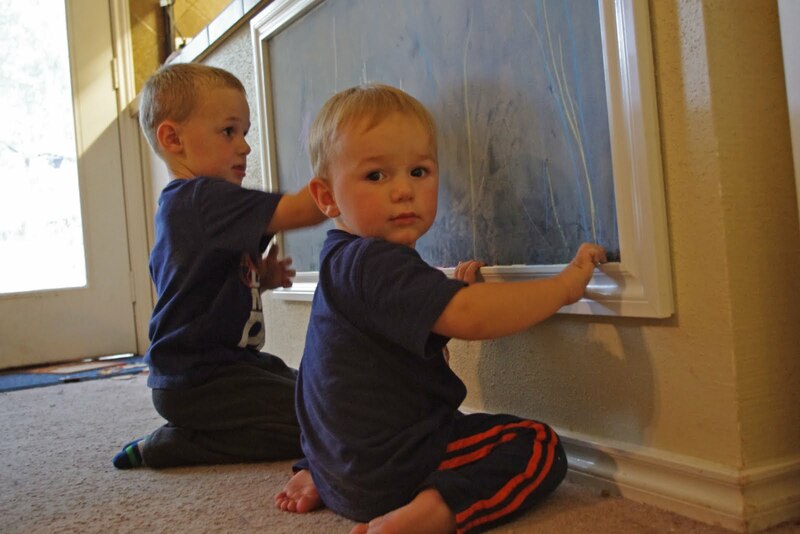 I don't want the chalkboard going anywhere, especially when it's my little monsters that are going to be playing with it. 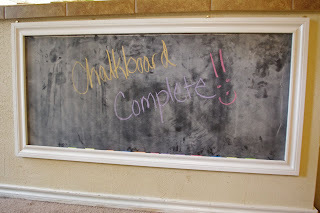 Once the drywall anchors were in place, I screwed the screws (seriously cannot think of a better way to say that) and hung up the chalkboard. The chalkboard is complete...almost. That was until I realized how crooked it looked. 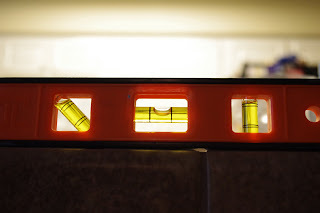 I used the level and check it again, on all 4 sides. Yup, it's level, but looks off. I check the counter. Awesome...counter, NOT LEVEL! At least this hangs low enough that no one else is going to realize it looks a little off kilter. Now, it's time for it to be fully tested. I let Maben at it! It takes the chalk well. How about how it does with another kid added. Come on over Colton. Both boys are happy with it. It has received quite a bit of use so far and even Colton's little fingers have no problem getting at the chalk. This project is a COMPLETE SUCCESS!!! 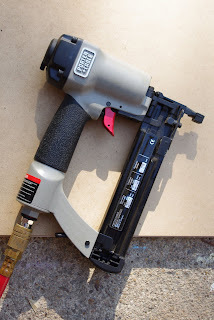 I found your project on Shanty 2 Chic. I love how you hung the chalk board lower so it is at a little persons eye level. 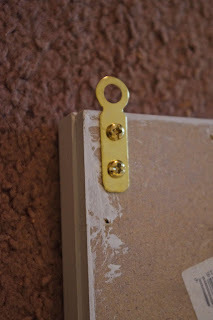 I am hosting a Toddler themed linky party and think your project is great. I hope you will stop by and link up.